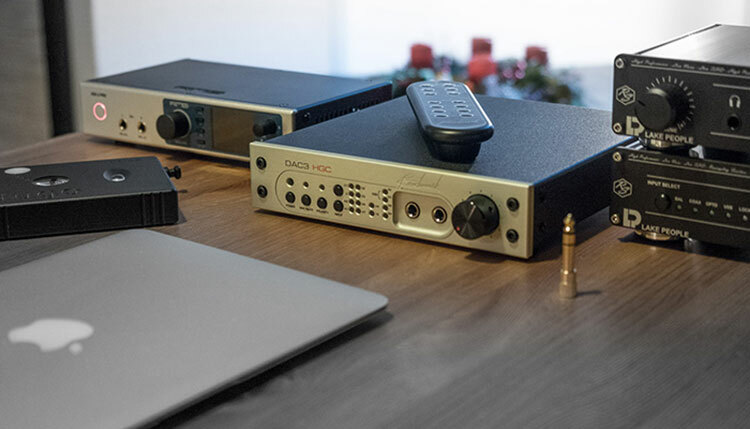 After having reviewed the breathtaking professional DAC/amp surprise hit RME ADI-2 Pro and the also spectacular Lake People Reference Series, it is time to see how an actual hifi consumer device compares to reference professional tools. 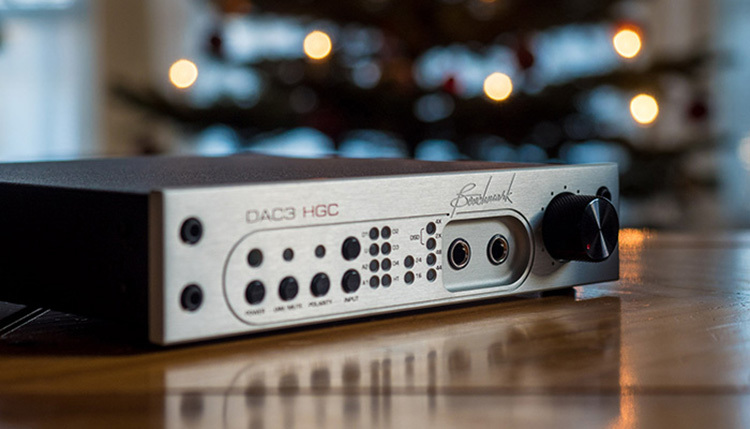 Turn your head to the Benchmark DAC3. Starting at around £2,349.00, stuffed with countless inputs and triple rear outputs, as well as dual headphone outputs, the DAC3 wants to become your well-equipped hifi system’s centerpiece. To top it off, Benchmark offers you a remote too. Though I’d categorize the DAC3 as a consumer DAC for home use, Benchmark advertises “neutral studio monitoring” quality. Let’s see how it competes against the rest. Packaging is pretty straight-forward. The DAC comes shipped in a white cardboard box with the brand name on top. The inside is securely laid out with foam. Nothing fancy and also no wasted costs. Accessories are fairly overseeable with a wire bound hardcopy of the manual, power chord, USB cable, and the remote. Depending on your distributor, you might also find an alternating current resistor to exchange 130 V and 240 V according to your country’s standard. At £2,349.00 I am allowed to be picky. In fact, I am allowed to be very picky and to highlight even the smallest of flaws. However, Benchmark Media did not break a sweat. This device is expertly built. 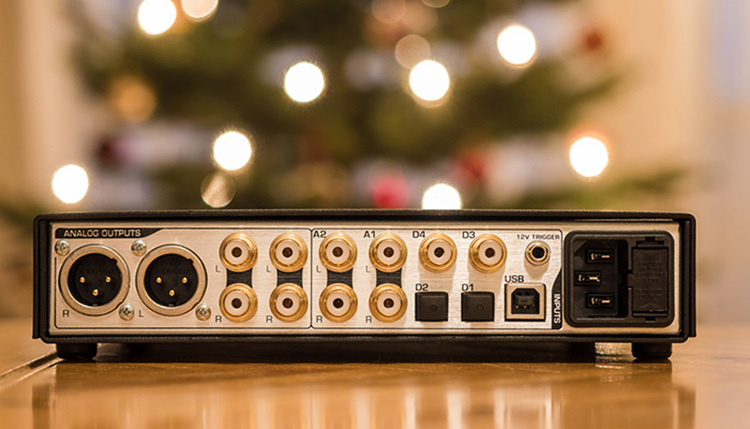 Starting from the back – because that’s where you want to look at a DAC first – we not only find an abundance of in- and outputs, but all contacts are gold-plated and placed extremely tight. It’s simply a joy to look at. The body is built from a black abrasive aluminum. I prefer this over the anodized aluminum that tends to scratch easily. This surface seems to be more durable. On the front, we are looking at a very thick matt aluminum faceplate that is screwed tightly with four rather large black bolts. The DAC3 is available in two different colors, my review unit is gray/silver instead of black. The latter looks sleeker and less bulky. The name Benchmark is precisely punched into the metal above the two gold-plated 6.3mm headphone outputs. The volume knob has a nice tactile feel without rasterization and it sits so firmly in place that one could expect it is prepared for dropping off the table. That, of course, you should not let happen. Mostly because the volume knob is motor-driven. A very neat feature is to watch the volume turn itself up after powering on the device. Furthermore, we find 16 indicating LED lights. They not only inform you about the active input, mute and optional polarity, but also about bit-depth and sampling rate of your input. Compared to most other DACs, they are only mildly annoying with a blue light. My review unit came shipped with a remote control. This is rather rare for a headphone amplifier but less so for a dedicated amp. In many ways, the remote reminds me of that from the Chord Hugo TT Benchmark’s remote is built completely out of metal and it feels very durable and comfortable in the hand. The buttons are a little bit hard to push, but the tactile feel is responsive enough to control the buttons completely in the dark. I had no issues with the layout, as you can find all inputs separately with a single push of a button. Sure, it’s nothing too fancy, yet it is a more than a nice extra. I think a remote can make all the difference for usability if you have set up the DAC in a fixed hifi setup that is two to three meters away from your couch. Especially since the DAC3 allows you to control the volume of the amplification – not only for the headphones. The remote control is included by default. There is also a DAC3 DX version for professionals that does not include the remote. Best to ask your dealer for confirmation before purchasing that the DAC3 L (no headphone amp) and DAC3 HGC (as reviewed) include it. At the asking price, Benchmark is facing some heavy competition. I was hesitant at first, but the amp impressed me the more I used it. The HGC is dead silent with deeply black background and a remarkable transparency. Plugging in the Focal Elear, the sound is lush, well-rounded and very, very tight. Bass reaches very deep and is well-textured. The treble speed with DT 1990 is wowing and the DAC3 does well at bounding the headphones’ analytical tendency into very enjoyable musicality. Even my new IEM reference ProPhile-8 performs perfectly clean with not the slightest hint of noise or distortion. The digital volume control in the lowest fifth part can be a bit tricky to adjust and it mostly relies on the acceleration of turning the volume knob, so this might not be my first recommendation for sensitive in-ears. But this doesn’t mean that you can’t use it with IEMs. At measured 0,1 ohms output impedance, the output is highly versatile and sounds very well-behaved with a silent background, deep blacks, linear response and high transparency. When fed with an analog source, the volume control is not regulated digitally and I can hear a very light channel mismatch at low volumes. Negligible for most consumers. Nonetheless, the Benchmark DAC3 focusses on full-size cans and performs admirably in this regard. The dynamics are almost on par with the ADI-2 Pro but the deep and black background manages to impress even more than the Chord Hugo. Plugging in some more difficult to drive modded DT 990s, the volume blasted my head off before I could notice any distortion. The DAC3 HGC has plenty of power! I can’t think of any consumer headphone that could push this one to the limit. This is a more than solid recommendation for amping headphones. Based on four ES9028PRO D/A converters, the DAC implements UltraLock3 to reduce jitter and also to support native DSD up to DSD64. As a Mac user, all I need is to connect the USB cable for full functionality. As usual, Windows users can download the firmware online (https://benchmarkmedia.com/pages/dac2-drivers) to use DSD over PCM (DoP). Playing The Alan Parson’s Project as native DSF files resulted in an amazing natural and holographic rendition, even though “native DSD” is actually being converted to PCM. Nonetheless, this is benchmark sound quality! Perhaps Benchmark Media has its name from their amazing harmonic compensation. The measured THD is the best I have ever had at home. The unwanted upper harmonics are way out of the audible area, resulting in a very natural, uncolored and clean sound. Unlike the ADI-2 Pro, Benchmark does not give the user the ability to play around with DA filters, but given the great overall performance, this is not necessary either and would probably only confuse most users. I agree with Benchmark’s marketing, the performance is on par with “neutral studio monitoring”, yet it is packaged nicely and consumer friendly. Of course, the DAC3 does not only amplify your headphones. It works as an amazing pre-amp too. Equipped with dual unbalanced outputs with RCA connection, I can think of many usages in an audio chain. 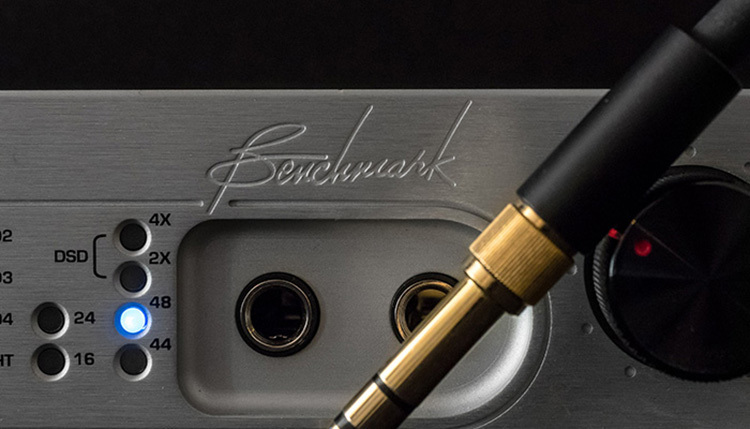 To top it off, Benchmark also installed a balanced 3-pin output for the more professional setup. Set up in my home system, I went with RCA straight to a vintage ONKYO speaker amp and the sonic improvement over the Chord Hugo was immediately noticeable. The output of the DAC3 can be programmed to match the input sensitivity of your power amplifier for a better system performance. The Benchmark really sounds great as a DAC in a speaker setup. I really don’t feel comfortable limiting the recommendation of the Benchmark DAC3 to any user. It is difficult to find any flaw and Benchmark definitely achieved as promised – “neutral studio monitoring” in the best possible way and in accordance with competing professional devices. There is no sounding or coloration and thus the DAC3 HGC provides any headphone with incredible transparent and dynamic amplification. However, low-volume listeners should be a bit careful when using high sensitive earphones. Instead, the DAC3 focusses more on providing enough power for the big ones. Do not worry about your Audeze LCD-4 or Focal Utopia, they will be provided with enough power to make them perform at highest levels. Some users often underestimate the importance of a well-amplified source. The DAC3 exemplarily shows off how positive high dynamics match with some coloration. When used with a DT-990, the DAC3 HGC manages to iron out most coloration and reduces any treble sibilance noticeably. The Benchmark DAC3 is not only for the top high-end headphones, it will help your push the performance of mid-tiers as well. First off, do note that the DAC3 comes in three versions: HGC, DX and L. The DAC3 L does not have the headphone amplification unit. The DAC3 HGC reviewed here is equipped with the HPA2 unit which used to be available separately. Throwing the DAC3 in a pool of competing and fairly similarly priced devices does not make it easy to pick a winner. Of all the devices I have reviewed – or used at home for a lengthy period, all of them have their strengths. Starting at the very top-end, the Chord Hugo Table Top is a show stopper. This is one heavy brick with a unique design. Sonic performance is incredible, yet both the Chord Hugo and Hugo TT have a somewhat magical uniqueness in the treble. It is a rather win or lose situation for the Benchmark DAC3 in direct comparison. Personally, I think the Benchmark DAC3 is so darn transparent in a non-analytical way, that considering the price point and the whole package with all the inputs, that it makes it very difficult for me to recommend the Hugo TT instead. Sonically, the Lake People Reference Series comes very close. The RS06 DAC sounds alike in many ways, but adding a dedicated head-amp to the RS 06 set closes the price gap significantly. Yet you’d still lack the comfort of a remote and a multitude of connections. The Lake People does not even allow two optical inputs at the same time. Pulling my writer’s choice 2016 RME’s ADI-2 Pro into the mix, also with a dual 6.3mm head-amp, I must say there are two completely different motivations behind the products. The Benchmark DAC3 is a device that simply works – a wonderful plug ‘n’ play DAC. The RME, however, might bother the user with firmware upgrades, different DA filters, dual EQ settings, different settings for different outputs, etc. And then it doesn’t even have regular RCA connections. Sonically, the RME is somewhat of a chameleon but never loses a more musical touch thanks to the AKM chips. The DAC3 will always sound more transparent, though. This should be an easy pick. Either you are looking for a desktop solution for monitoring and tweaking, or you need a carefree package that will be the heart of your stereo system for a long time. £2,349.00 is not cheap. I will not lie, I was anxious at first, especially in regards to the slightly less expensive competition. But Benchmark did not fail me. The converted sound is rich in dynamics, crystal clear and completely transparent. 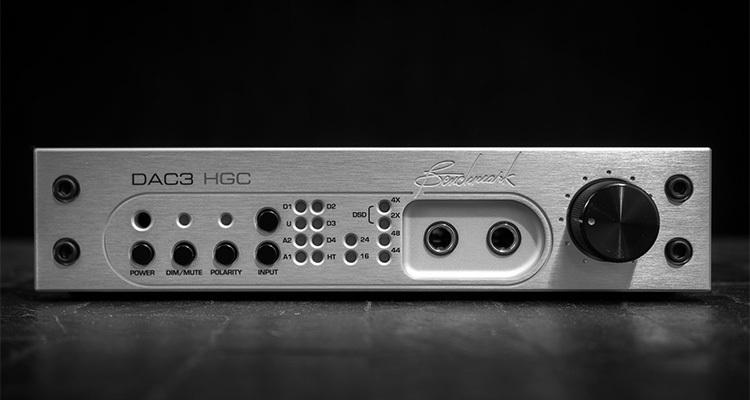 Looking at the complete package, the DAC3 (HGC) offers everything one would need. It would be a shame to only use it as a desktop DAC to amp headphones. Despite its rather small appearance, the DAC3 deserves to be a hifi stereo’s main centerpiece. 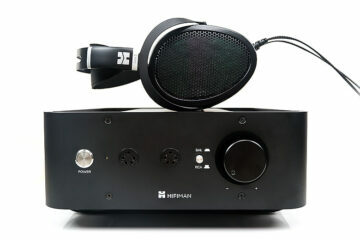 Dual analog, dual optical, dual coax and a USB input with native DSD support accompany dual headphone, dual unbalanced and 3-pin balanced outputs. The optional – but highly recommended – remote control top off the audiophile consumer’s dream. If the Benchmark DAC3 fits your budget, this is a really good recommendation. Hi, putting price aside, which would you prefer, the Chord Hugo TT or Benchmark DAC3? Thank you! Will you be using the device as a headphone amplifier? If yes, I would prefer the Hugo TT (and also the Hugo 2) over the DAC3 HGC. I’ve been looking into different filters and their measurements. I think in a head-to-head battle, Chord’s WTA filters are very well done and could be a plus for very attentive listeners. The Benchmark wins with connectivity, though. But which one sounds better? I saw the RME now also has a DAC version for the audiophile. Is the RME still the reference in this case I would say you prefer the the RME? if you are talking about the rear output, I think it is very much a tie. The Benchmark is a very streamlined no gimmicks D/A converter. Of course the Benchmark doesn’t have the functionality and features of the RME. The ADI-2 DAC has a very slight advantage over the ADI-2 Pro even. If you are concerned about the headphone out, the RME is far superior to the Benchmark. You can use the ADI-2 Pro version for balanced cables and the ADI-2 DAC for ultra-sensitive IEMs. Personally, yes, I prefer the ADI-2 Pro/ DAC but I mostly use it with headphones. I use NOS filter, crossfeed and PEQ.